Yesterday it was reported that the Wilpons will only have to pay $162 million to victims of Bernie Madoff’s ponzi scheme thanks to a settlement reached with trustee Irving Picard. Given that the Wilpons also count as victims of said scheme, they’ll likely get some money back that will mitigate the loss further. While this is good news in part because fans will be able to focus more on baseball this season now that the lawsuit isn’t hanging over the team’s head, there are some who want they Wilpons out as owners who are probably less pleased. Aaron Leibowitz over at Rising Apple wrote a column today that debates whether loyal fans should boycott the team or not. It’s strange. On an individual level, a fan can’t do jack. But sometimes on a grand scale, the fans can change everything. In the case of the Mets, there appears to be only way that the Wilpons will lose control of the team, and that’s if the line for Shake Shack regularly shrinks to less than an inning long. If no one shows up at Citi Field, the Wilpons will struggle to pay off their debts, and it might actually be enough to jolt Bud Selig from his friendship-coma with Fred and force him to apply some serious pressure. Eventually, Leibowitz decides on holding onto his season tickets, but it is the mere idea of boycotting that I want to look at. Forcing the Wilpons to sell the team that they seem intent on holding onto so dearly would presumably allow someone with more money and more common sense than the Wilpons to buy the team and turn the Mets around. The big assumption here is that the Mets can be immediately “fixed” with money. I’m not so sure that’s the case. In recent history, the Mets have been very competitive for a pair of spurts. One was from 1997 until 2000, when the team won at least 88 games every year, made the playoffs twice and won the National League pennant. The other was from 2006 to 2008 when the team again won at least 88 games every year, but only made one playoff appearance. The point is, even when the Mets had money, they didn’t have much sustainable success. The late-90s teams were built on the backs of free agents like John Olerud, Bernard Gilkey, Robin Ventura and Al Leiter that soon got old, left town, or both. 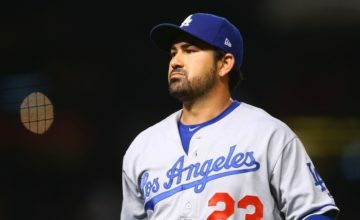 The late-aughts teams were built more properly around a couple of homegrown studs, but general manager Omar Minaya relied too much on roadside pick-ups like John Maine and Oliver Perez in his rotation. Veteran free agents Tom Glavine and Pedro Martinez got old, the bullpen collapsed, and Maine and Perez turned back into pumpkins. As a result, and despite the efforts of Jose Reyes and David Wright, those Mets failed to make the playoffs in 2007 and 2008. 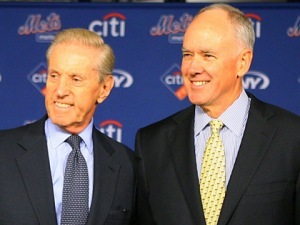 Now that the Wilpons have finally given Minaya the boot and replaced him with a front office all-star team of Sandy Alderson, Paul DePodesta and J.P. Ricciardi, now is the time to unseat the owners? Finally, the Mets have some guys in place who value the development of a farm system and creating a consistently successful baseball organization, and now we want to upset everything? Yes, the rebuilding process would be accelerated if the Mets had owners with money, but letting the Mets collect prospects and allowing those prospects to develop will only pay more dividends in the long run. Telling fans to be patient is often a waste of time, so I won’t. Fans can be an impatient as they want, but the team isn’t being sold anytime soon. 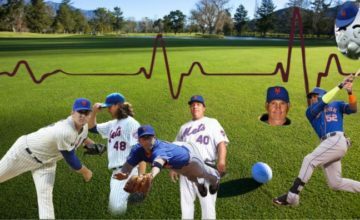 The next two or even three years likely won’t yield many wins, but with the talent the Mets are building up, particularly in the starting rotation, the wins will eventually come. With wins come fans, even those who lost their patience back in 2011. 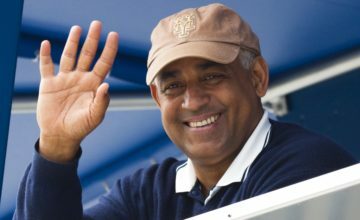 With fans come the revenue and prestige that are needed to sign the top tier free agents that can turn the Mets into a contender again. Sandy Alderson is much more wary of long-term contracts than his predecessors, so I trust that whatever moves he makes (or the Alderson underling that takes over for him makes) will be more sound than the Mo Vaughn signing. Won’t the Wilpons mess it up? I’ve said this before, but I really don’t think a veteran of the baseball business like Alderson would come to a mess like the Mets just to get bossed around by a couple of guys who aren’t very good at baseball decisions. He’s not desperate for a job and he’s not a youngster trying to make his name in the business, so I believe Alderson is absolutely in charge of the Mets rebuilding process. That’s why a boycott to push the Wilpons out doesn’t make sense. Very well said. Say what you want about Freddy Coupons, he never used the Mets or Major League Baseball as his personal ATM as other team owners have. Yes, it would presumably allow someone with more money and more common sense than the Wilpons but the team. But more likely, it would enable someone with more money and LESS common sense than the Wilpons to buy the Mets. Sandy’s an ex-Marine with a tour of duty as an infantry officer in Vietnam. No one is walking over him. Semper Fi!